Action Alert! Act Now to Ensure Mexican Grey Wolf Recovery! Need Your Help by September 11, 2013. The future of the Mexican Grey Wolf depends on your help and needs comments now. The U.S. Fish and Wildlife Service has proposed changes to the rules governing the Mexican Wolf reintroduction into the wild. This proposal, with one very good and many very bad changes, is very important to the future of Mexican wolves. 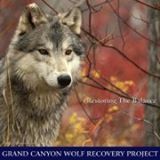 Please visit Grand Canyon Wolf Recovery Project to learn how you can help.